Last month, Circular Economy Lab collaborating partner Smart Prosperity Institute (SPI), released a publication entitled Getting to a Circular Economy: A Primer for Canadian Policymakers. It is the first of a series of policy briefs by SPI intended to relay core concepts of the circular economy to Canadian government and business stakeholders. These policy briefs will be valuable resources to anyone looking to better understand circular economy issues and opportunities in a Canadian context. Some key insights from this first brief are noted below, with links for further information and access. Circular economy and clean growth are not the same thing. The distinction is important. As noted in the brief, “Both approaches focus on a low-carbon economy, economic growth, innovation and new technologies, but the circular economy responds to a broader set of environmental drivers, uses a broader set of responses, and looks for a system- scale, deeper level of innovation – business as well as technological. As such, it holds the potential for the deeper emission reductions critical to the climate file, but could also be more disruptive to the current model of the economy.” Canada’s clean growth agenda on its own is not enough to reach our Paris Agreement targets and the UN Sustainable Development Goals; circular economy approaches may help close that gap. Canada has fallen behind an international economic and social shift, headed by Europe, towards a circular economy. As a global leader in Extended Producer Responsibility, Canada has seen some of the positive potential of adopting circular economy. However, the benefits that could accrue to the environment, the economy, and the business sector by shifting the national strategy remain largely untapped. 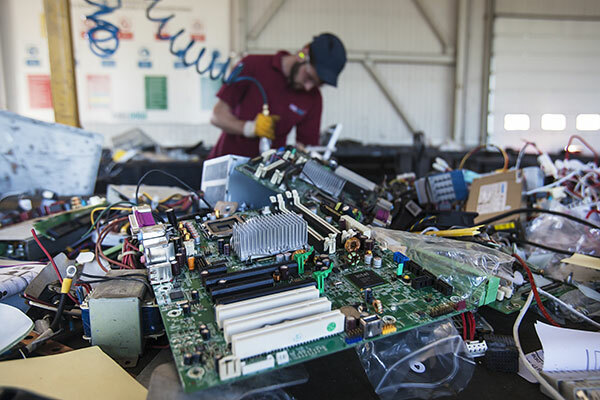 A circular economy encompasses a vast number of strategies that could aid Canada in shifting away from a paradigm of take-make-waste towards one of take-make-reuse. SPI advises six strategies for Canadian businesses and governments, tailored to the country’s economic, environmental, and business landscape: Extended Producer Responsibility programs and policies, green procurement, government investment in circular economy research, business and civil partnerships, leveraging city-based economies as hubs for innovation, and perhaps most importantly, the development of a national road map towards a circular economy. A successful transition to a circular economy in Canada is still in its infancy. Progress is hindered by the gaps in research and understanding. The SPI brief highlights critical questions that must be answered for the successful design and implementation of a Canadian circular economy: Will the circular economy be a cost-effective solution for sustainability and decarbonisation? How will Canada’s social and economic landscape be influenced by a circular economy? What is the full scope of challenges and opportunities that might arise in Canada’s transition to such an economy? To learn more about the the Smart Prosperity Institute, visit their website at the link below. Getting to Circular Economy: A Primer For Canadian Policymakers is available as a free digital download on the SPI webpage. Kai Bruce is a volunteer blogger with The Natural Step Canada.